Today I am sharing Tahchin Lubia Cheshm Bolboli with Mahicheh. The exact translation of Tahchin is “layered in the bottom,” of the pot that is! 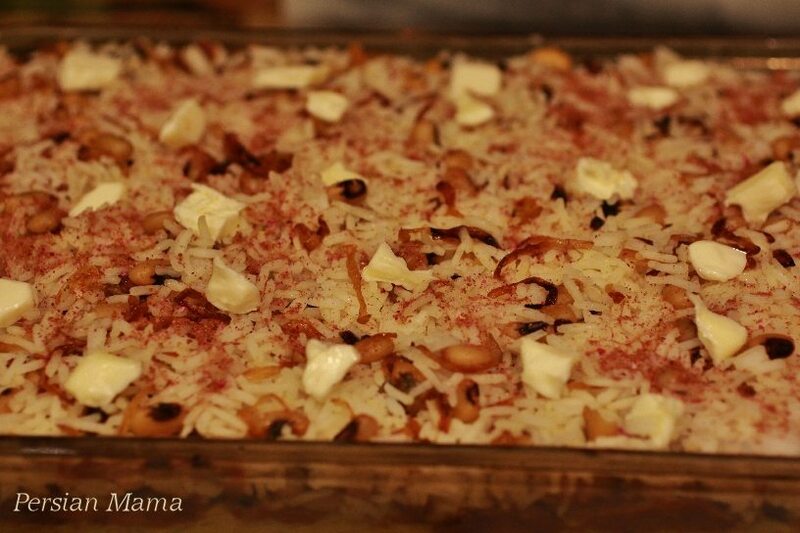 Tahchin is a favorite Persian rice dish that is baked either in shallow pans in the oven or in shallow nonstick pots on the stovetop. The recipe that I’m sharing is baked in the oven. 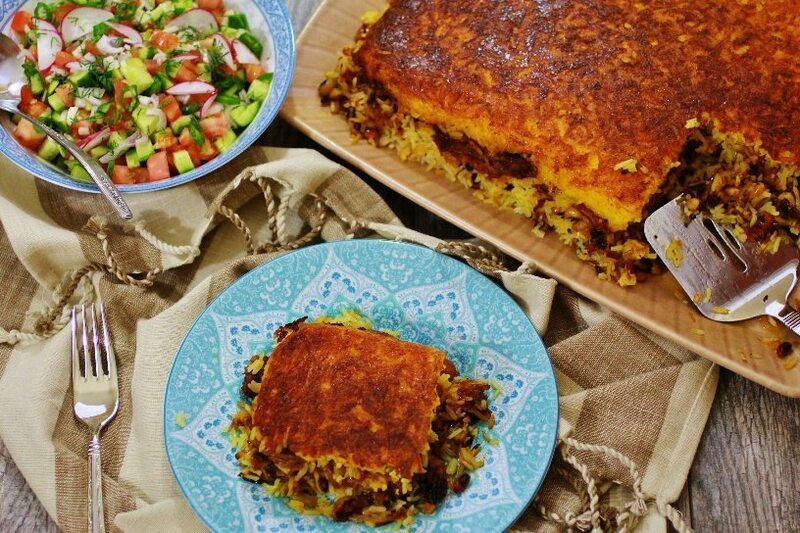 Unlike the usual rice and khoresh, where each are cooked separately and then served together, the rice and meat or vegetable in Tahchin are layered and baked together. 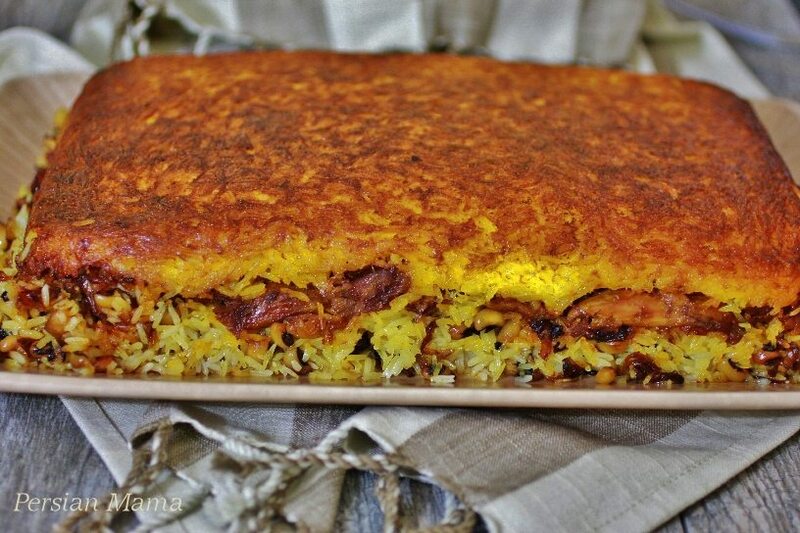 Tahdig which is without any doubt the best part of this amazing Persian dish is the golden crust in the bottom of Tahchin that is made by layering the bottom of the pan with a mixture of egg, yogurt, saffron and par-cooked rice, then layers of rice and meat are added to the top and baked in the oven. Doogh is a mixture of special sour yogurt and water. It can be purchased at Middle Eastern markets. Buy the plain doogh without any flavoring or carbonation. I had a bottle of doogh soda, which is carbonated and used that instead, after whisking it for a few minutes to get rid of the carbonation. Prepare the black-eyed peas ahead of time and set aside. Discard the doogh used in the marinade. Add the lamb shanks to a Dutch oven. Add diced onions, turmeric, pepper and water. Bring it to a boil, then reduce the heat to the mark between medium low and low, cover the pot and cook for about 4-5 hours, or until the meat falls off the bone. Let it cool a bit, and de-bone the lamb shanks. Divide the broth in half. 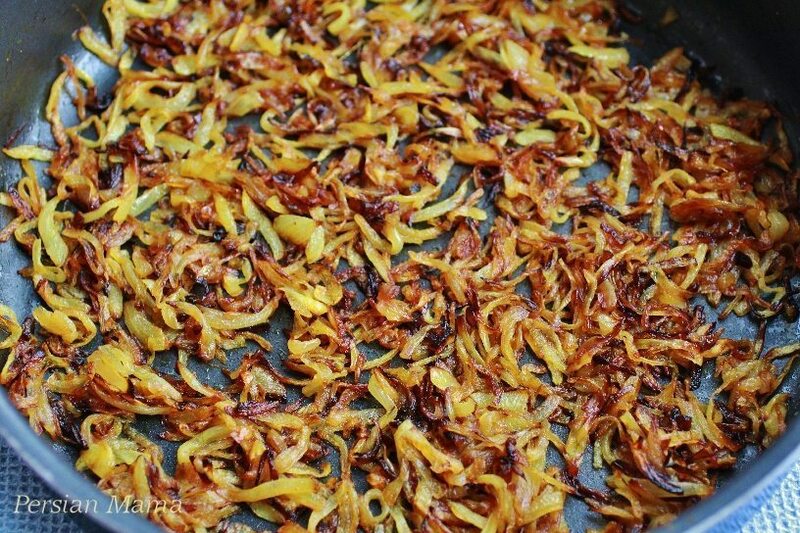 Meanwhile thinly slice the medium onions and fry them to golden brown with some turmeric. Save 1/3 of it in the skillet for the cooked lamb. The rest will be mixed with cooked black-eyed peas. Start making the rice when the meat is almost ready. 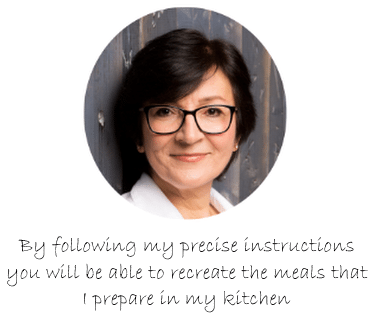 Follow the directions for the Persian Steamed Rice up to the point where the rice is par-boiled. Drain it in the colander and rinse under cold water. Set it aside until you’re ready to layer it with the cooked lamb and peas. Add half of the broth and a pinch of cayenne pepper to the prepared black-eyed peas and cook until all the liquid is cooked off and the peas are very tender but firm. Add the rest of the fried onions to the cooked peas and toss. Set aside. 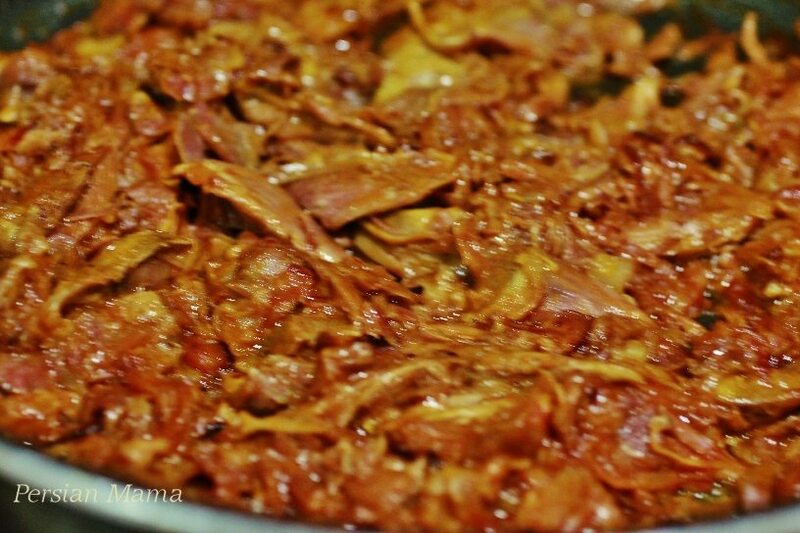 Add some tomato paste to the fried onions in the skillet and saute until fragrant. Add lemon juice, the rest of the broth, saffron and salt. Bring it to a low boil, add the cooked lamb and toss. Turn the heat to low and toss several times until almost all of the broth is cooked off. 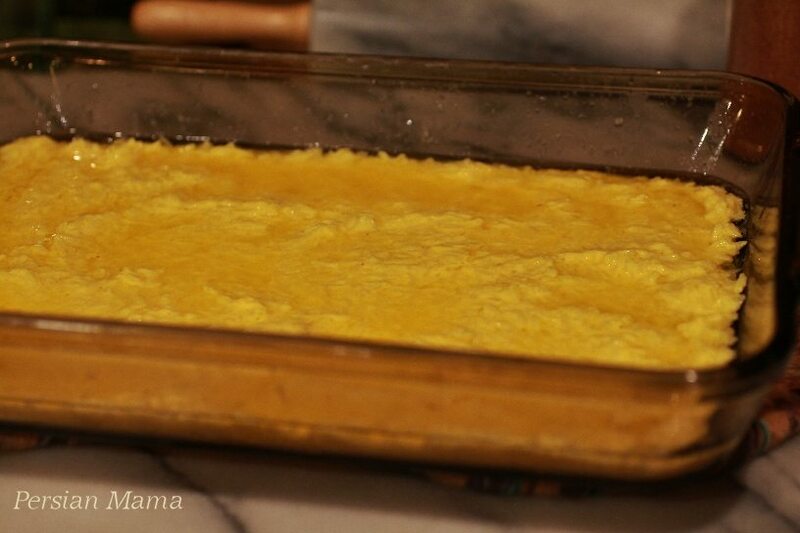 Similar to my Tahchin e Morgh recipe, the the bottom layer of this tahchin is a mixture of yogurt, egg, saffron, a bit of vegetable oil, and two cups of the par-cooked rice. The second layer is some of the par-boiled rice, lightly sprinkled with rice spice. For the third layer the lamb mixture is spread evenly, to cover the rice layer. For the fourth layer, toss together the black-eyed pea and onion mixture with the rest of the rice and evenly spread it over the meat. Sprinkle some rice spice on top. 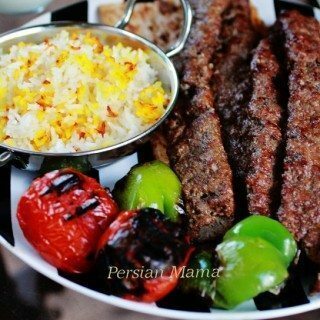 Enjoy this delicious Tahchin Lubia Cheshm Bolboli ba Mahicheh with some Salad Shirazi. I had some radishes and fresh dill so I added them to my salad! Prepare the black-eyed peas ahead of time: Pick through them for debris, wash and rinse under cold water and add to a 2-Qt saucepan. Fill the pan with water (about 2 inches above the level of the peas). Add 1 tsp salt and without covering bring it to a boil over medium high heat. Reduce the heat to medium and Boil for 5 minutes. Turn off the heat, cover the saucepan and let it sit for 2 hours. Drain all the cooking water. Add fresh water and 1 tsp of salt. Bring it to a low boil and cook for 5-7 minutes until tender but firm. Drain and return to the saucepan. Trim all the fat from the lamb shanks. In a container arrange the lamb shanks in a single layer. 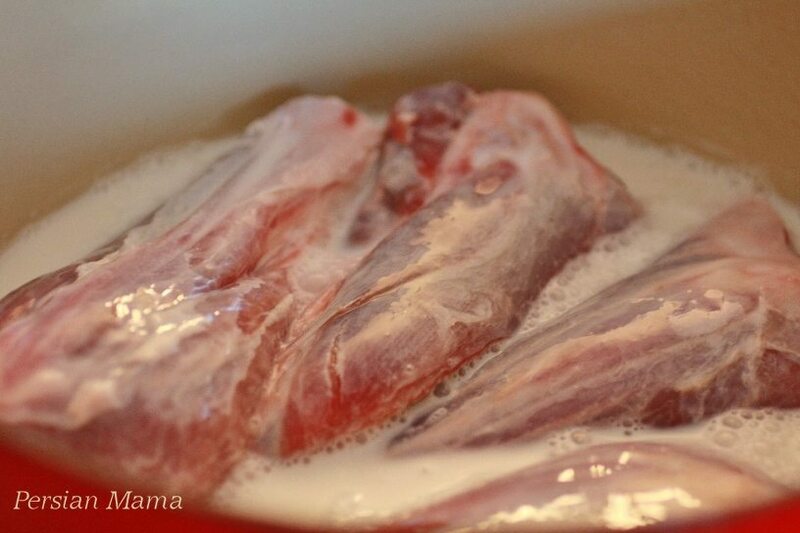 Pour the doogh (yogurt drink) over the lamb shanks and marinate for one hour. Turn once after 30 minutes and let the other sides sit in the marinade for another 30 minutes. Discard the doogh and add the lamb shanks to a 6-Qt dutch oven or any other heavy bottomed pot with a very tight lid that allows very little moisture loss. 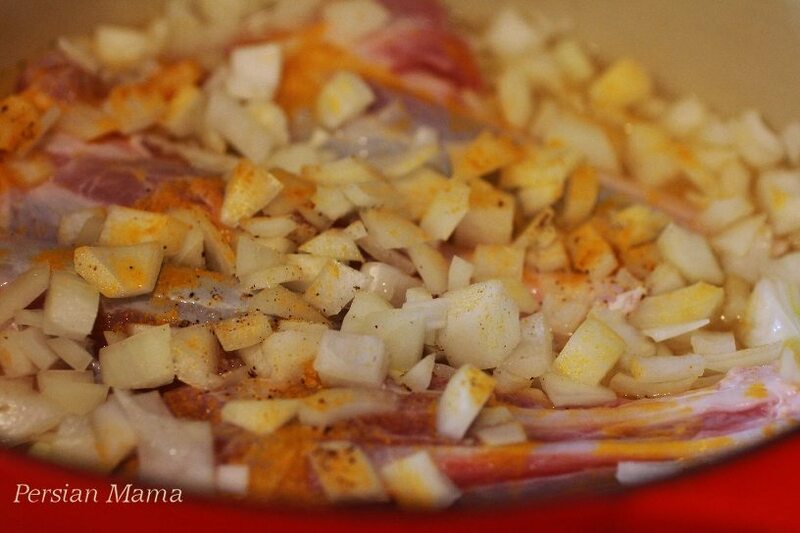 Add turmeric, diced onion and freshly cracked black pepper. Add 2 cups of cold water. Bring it to a boil. Reduce the heat to lower marking of medium low (between medium low and low) cover and cook the shanks until they literally fall off the bone. Adjust the temperature if you have to in order to maintain a low boil during the cooking. This will take anywhere from 4-5 hours depending on the meat. If using small chunks of stew meat the time reduces to about 2 hours, or until the meat is very tender. By the time the meat is done there should be about 1-11/2 cups of broth in the pot,add extra water if needed. Remove the lamb shanks from the pot. Once cool enough to handle, separate all the meat from the bone. Try to leave the meat in large chunks. Add half of the broth and a pinch of cayenne pepper to the cooked black-eyed peas. Without covering it cook over medium low heat, until all the liquid is cooked off and the peas are tender. Meanwhile peel and thinly slice 3 medium onions and fry in oil and butter in a large nonstick skillet over medium heat. When they start turning light golden brown, add ¼ tsp turmeric powder, stir and continue frying until rich golden brown and crispy. Keep ⅓ of the fried onions in the large skillet and add the rest to the cooked black-eyed peas and saute for 2-3 minutes over medium low heat. Set aside. Preheat the oven to 400 F, the lowest rack. 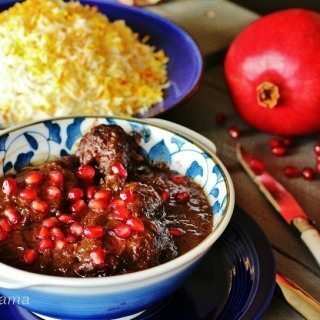 Follow the directions for the Persian Steamed rice up to the point where the rice is partially cooked and is firm in the center and soft on both ends. Drain it in the colander, rinse it under running water and set aside until you are ready to layer it with the meat and peas. In the large skillet add 2 TBSP tomato paste to the fried onions, saute over medium heat for 2 minutes until aromatic. Add 1 TBSP fresh lemon juice, ¾ tsp kosher salt, the rest of the broth and optional saffron to the skillet. Bring it to a boil over medium low heat. Add the cooked lamb pieces and continue cooking until almost all of the broth is cooked off. Set aside. In a small bowl whisk together the egg, yogurt, and saffron. Add 2 cups of cooked rice. Add 1 TBSP vegetable oil and mix to combine. Add the 5 TBSP oil and 5 TBSP butter to a 9x13x2 ovenproof glass pan and place it in the preheated oven (only until the butter is melted and oil is hot, 3-5 minutes). The oil can get extremely hot in a very short time, if this happens you need to turn off the oven and wait for the oil to cool off before handing the pan to prevent burns from oil splatter. Using mittens carefully remove the pan from the oven, place it on a heat pad. Add the yogurt and rice mixture to the bottom of the pan. Spread evenly. Sprinkle 2 cups of the cooked rice evenly over the yogurt mixture. Sprinkle with about ½ tsp rice spice. Spread all of the meat mixture evenly over the rice. 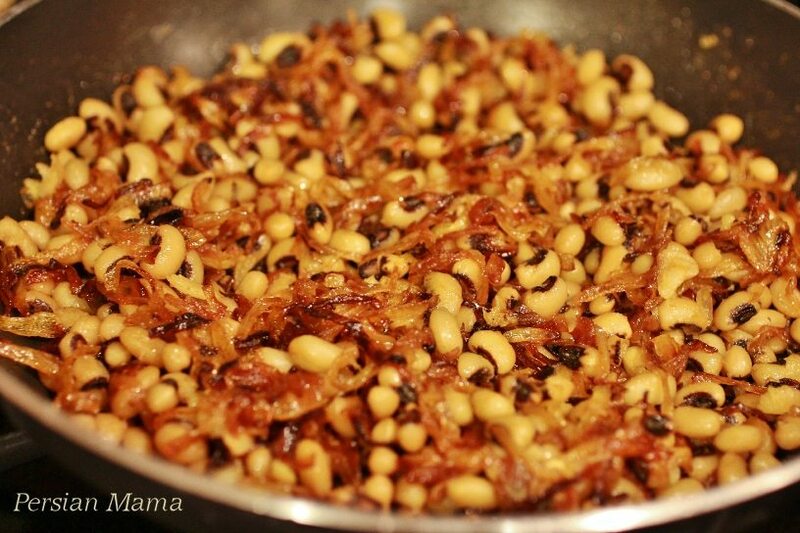 Add the black-eyed peas and onion mixture to the rest of the rice and toss to combine. Layer the rice and pea mixture over the meat mixture. Sprinkle with ½ tsp rice spice. Dot the top with cubed cold butter. Cover tightly with an aluminum foil. Make slits in four corners of the foil and a few in the center. 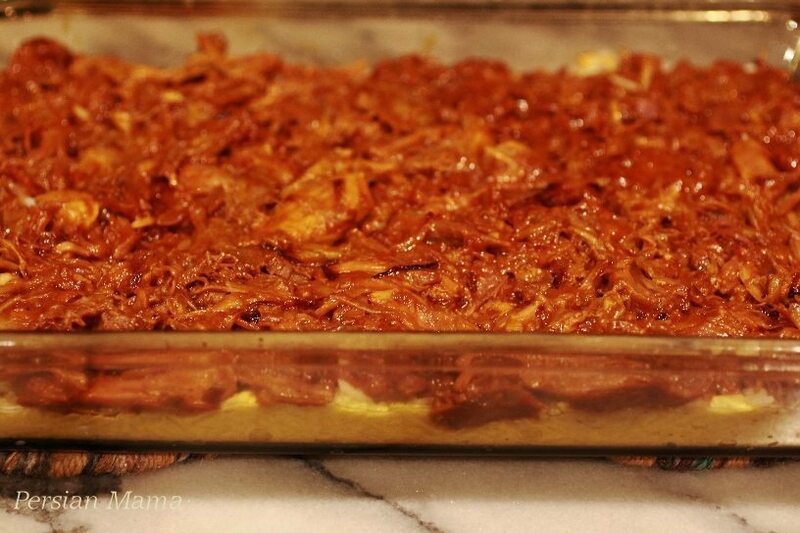 Bake in the oven for 1 hour 15 minutes, or until the tahdig is golden brown. Invert the tahchin by placing a slightly larger rectangular platter over the pan. Using mittens grab both the pan and platter and invert, so now the bottom with golden tahdig is on top. Remove the pan and allow the tahchin to sit for 10 minutes before cutting it to 8 equal pieces with a sharp serrated knife. 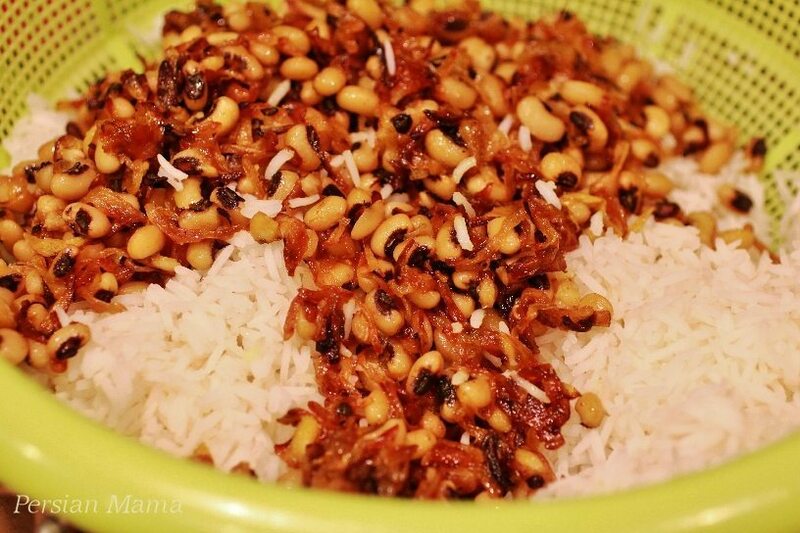 Enjoy the Tahchin with some Salad Shirazi. Persian Rice Spice is a blend of cumin, cinnamon, nutmeg, cardamom and optional dried rose petals. Thank you (and your sister in Iran )so much for this nice wonderful surprise! You went through all this effort after I asked you about this dish in my previous email! 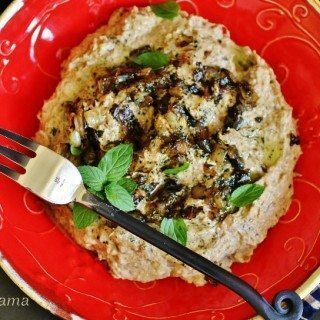 I had promised my friends to make this Tahchin for our upcoming Norouz party but had no clue how to make it! I hope mine will be turn out as good as yours! Once again a big thanks! Farinoosh jan, you’re welcome, it was my pleasure! I had fun creating the recipe and love how amazing it turned out, thanks for the inspiration! I Hope you and your friends enjoy it as much as my family did. Have a happy Norooz and a wonderful new year. 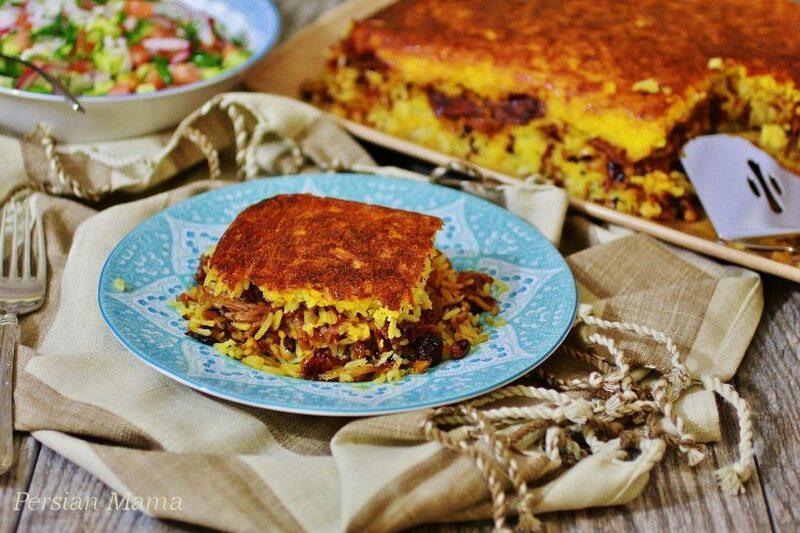 This tahchin was a big success and eaten to the last grain of the rice! Thanks again! Farinoosh jan, you’re so welcome! So nice of you to let me know, that is just fantastic. Wow Homa! Everything you make is with so much detail and care. I love your style! Indeed this tahchin is special. With an attribute given to you, that I learned it here, I shall marinate lamb-shank in dough next time. Brilliant! Thank you my friend for your kind words! So good to hear that you will try the doogh technique, it is well worth the effort. Man dirooz in tahchin ro dorost kardam va in avalin bar boud ke berenji be in khoshmazegi mikhordam…!! mamnoon az dastore pokht :)) kheili kar bord vali natijash ali boud! Drood Fariba joon, You’re very welcome! I am very happy you liked my recipe. Okay, suppose I wanted to make this for baby’s birthday lunch. 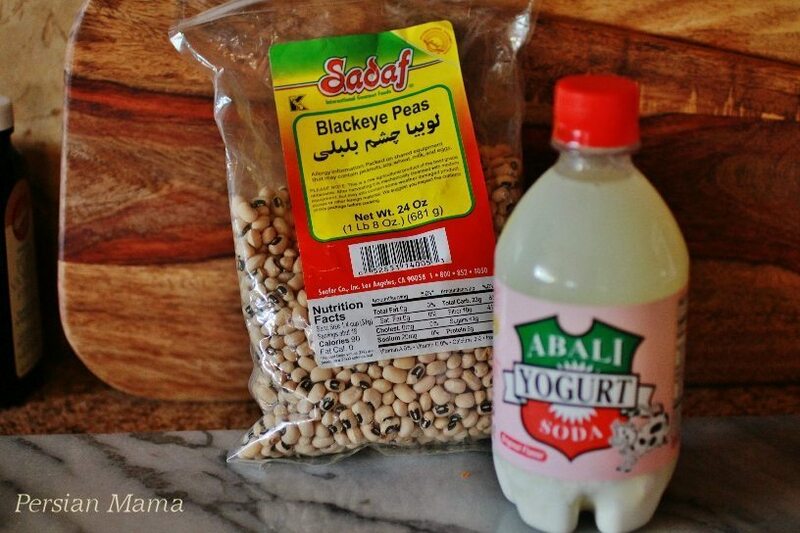 I need a substitute for the yogurt drink because there’s no place for me to buy it around here. And also can you tell me how far ahead I can get in terms of making this the day before? Could I assemble, refrigerate overnight, and bake the next day? Also, do you think this would be okay with stew beef or should I go all out and buy lamb shanks? *You will be able to make your own doogh (yogurt drink) by whisking together 2/3 cup yogurt with 1 1/2 cups of water and a pinch of salt. *You could cook the meat sauce and the peas the day before. I don’t recommend assembling it the night before, as the rice becomes hard and brittle and you won’t like the texture. *Lamb shanks are preferred in this recipe; the bone-in shank meat cooks a lot moister and more tender than stew meat. Looks delicious! What can I use instead of doogh if I cannot use dairy? Would sparkling water and non-dairy yogurt work? Hi Shirley; yes, you could use a mixture of nondairy yogurt and soda water 50/50. Happy cooking and have a wonderful new year!